The massive downside of polling day for me was witnessing the total farce that was the St Paul's Church polling station in the Jewellery Quarter. I was contacted by a friend at 9.10pm to say there were hundreds of people in the queue and he was worried about not getting to vote. 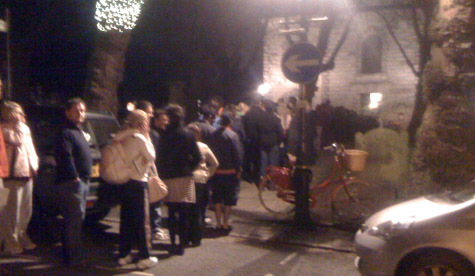 I arrived a few minutes later and was stunned by the length of the queue, at the time it must have numbered 200 people, both inside and outside the church. I spoke to the polling station staff and several people in the queue and made several phone calls to see if anything could be done about the situation. I stayed until approximately 9.45pm before heading to the NIA for the count. According to several reports the polling station remained open until 10.07pm allowing some people to vote, but estimates of 100 people were turned away. This must never be allowed to happen again. There was clearly a failure in planning which allowed one polling station to cover over 3,000 residents on a General Election day. I must be clear, I am not claiming the result should be called into question. But approximately 100 people have had their right to vote removed because of poor planning. This is simply unacceptable, particularly in this day and age when so many people had been turned off politics. I have written to the Elections Office, the Electoral Commission and the Police to highlight the problems and to request that a second polling station be used for the Jewellery Quarter in future years. The location for that could be St Paul's Church itself, or a city centre location for those residents on that side of the area. One suggestion from the Conservatives is the Museum of the Jewellery Quarter, which I would also support. I have also requested a full investigation be conducted into why the polling station remained open until the arbitrary time of 10.07pm. If you were affected by the problems, the Electoral Commission wants to hear from you. My congratulations to Carl Rice on being re-elected and my congratulations to the other defeated candidates on running generally positive campaigns. The campaign from Labour was certainly more positive than in other parts of the city, such as the gutter politics from Roger Godsiff in Birmingham Hall Green. We achieved nearly 30% of the vote, an incredible increase from the 13% achieved at the last local elections in 2008. This just goes to show that despite Labour's constant bleating, residents are simply not outraged by the Liberal Democrat / Conservative coalition we have running the city. The number of emails, phone calls and letters of support I received during the campaign was simply overwhelming. Thank you for all of those - and thank you to everyone who helped during the campaign. The numbers volunteering throughout the campaign was really encouraging for all of us involved. We will continue to work for and campaign on behalf of the residents of Ladywood over the next year. I'll also make a real effort to keep this blog going, too! Birmingham City Council's planning committee have given the final approval to plans to redevelop Birmingham New Street station. The bold design will transform the welcome visitors to Birmingham receive, with vastly increased passenger capacity thanks to a bright, new concourse. The station is going to remain operational throughout the work, which starts later this year. Phase 1 should be complete by 2012. 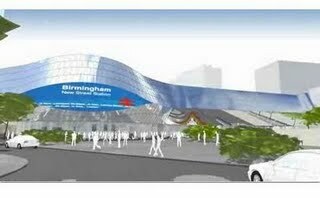 But what will make the most difference for Birmingham's commuters is reopening the Camp Hill line. The local Neighbourhood Policing team have recorded a video to update residents and businesses of the Jewellery Quarter on their priorities and recent action. This video report is a positive step in the right direction, opening up lines of communications between the police and residents. I'm especially pleased to see the action taken on traffic and in particular one-way streets. Those living in the Jewellery Quarter and readers of my last FOCUS will know it's a big issue around here. There's still plenty of work to do in this area, but it's good to know a start has been made. Birmingham's brand new city centre park is a step closer to reality as an outline planning application has now been submitted. The planned park is an unusual long, narrow shape snaking its way through the Eastside area. Beginning by Moor Street Station off Park Street, the park will wrap around the front of the new BCU campus building up to Thinktank's Science Garden in front of Millennium Point. The park then runs alongside most of the length of Curzon Street. Commuters and travellers arriving in to Birmingham New Street from Birmingham Airport and London will get a full view of the park. For too long this major route in to the city has given visitors a negative impression of the city. It also gives the increasing number of city centre residents a space to enjoy, along with families wanting a break from shopping trips in the city. You have the chance to comment on the proposals up to 18th February using the Council's Planning Online tool. Tesco has submitted plans for a new superstore on the edge of Birmingham City Centre, within walking distance of the Jewellery Quarter and much of Ladywood. 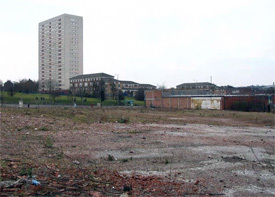 The land, bounded by Camden Street, Icknield Street and Spring Hill, has been derelict since 2002 when the former Brookfield shopping precinct was demolished. It had long suffered from a lack of tenants and vandalism. Tesco have owned the land for some time so an application has been expected. But the application is for more than just a Tesco! The existing Spring Hill Library is sympathetically blended into the development, benefitting from a new glazed entrance and external lift. There will also be four smaller retail units facing Spring Hill with office space above, a small number of maisonettes on the Brookfields side of the development and undercroft car parking. I'm cautious of new supermarket developments and the impact they can have on local businesses. However in this case I think the development will benefit surrounding businesses - and help provide new jobs in the constituency with the highest unemployment in the UK. Ladywood looks set to benefit from a share of 101 new local authority homes as part of a £5.4m Local Authority New Build (LANB) grant. New affordable homes are desperately needed in the city so I welcome this news. I urge the Council to ensure these homes are insulated to a high standard, to keep living costs down. According to the press release, the homes will be built to "high energy efficiency standards meeting Level four of the Code for Sustainable Homes", which sounds positive.